Fourth Row Center: Film Writings by Jason Bailey: New on Blu: "Mad Max"
One of the first things we see in George Miller's Mad Max is the distinctive logo of American International Pictures, the famed purveyors of low-budget entertainment; the Corman-led company picked up the American distribution duties for this low-budget Australian barn-burner (it was one of their last releases before being sold to Filmways in 1980). Somehow, that insignia--as well as the bold titles and big, brassy score that follow it--put us in exactly the right mood for the loud, ugly, viciously entertaining picture, which is exactly the kind of smash-and-grab exploitation job you'd expect from AIP, albeit this time with an Aussie accent. 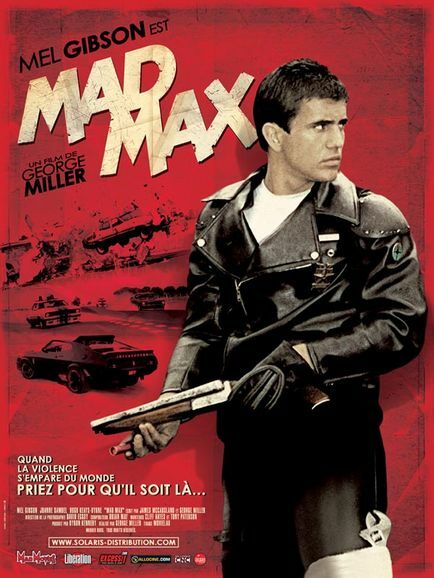 In the years since its release, Mad Max has accumulated an abundance of cult credibility, both as the first film in a series that spawned the massive hits The Road Warrior and Mad Max Beyond Thunderdome, and as the breakthrough film of one Mel Gibson, then all of 22 years old. Gibson may have been an unknown, but director Miller gives him a movie star's entrance, slowly revealing him to the camera, his face obscured for his first shots, seen only in oblique cutaways as he suits up to join a high-octane car chase already in progress. Set "a few years from now," the film imagines a somewhat dystopian Australia in which the leather-clad MFP (Main Force Patrol) struggles to keep the roads safe from roving bands of motorcyle gangs and other thugs. "Mad" Max Rockatansky (Gibson) roars in to save the day when the MFP can't catch gang leader "Nightrider," but in doing so, he sets himself up as a target for the leader's next-in-line, "Toecutter" (Hugh Keays-Byrne). The broad strokes of the story aren't hard to predict; aside from the obvious stakes raised by the cold-blooded set-up and murder of Max's partner "Goose" (Steve Bisley), Max has a wife (Joanne Samuel), child, and home life is so idyllic that you know somebody's going down in time for some third-act vengeance. But Miller (and co-screenwriters Byron Kennedy and James McCausland) get away with some of the more plodding storytelling by displaying a sense of humor--in the dialogue ("You're blaspheming again," one cop tells another, "and I don't have to work with a blasphemer"), in the over-the-top, cartoony villains, and in the brash style. The justifiably famous action sequences are thrillingly kinetic, infused with the picture's scrappy, low-budget energy (the stunt work was practical, real, and looks as dangerous as it feels). The film delivers its thrills as fast, nasty jolts, gooses to the audience. It's a little silly and a lot melodramatic, but Miller seems to know that, and revel in it--though there's no defending the stale Semi-Obligatory Lyrical Interlude, complete with crap saxophone music and dopey, confessional dialogue. The cat-and-mouse pursuit of the middle section is somewhat lacking, both in narrative urgency and in wise decision-making by the characters; in these sequences, the attempt at Straw Dogs-style domestic terror is markedly less successful than the visceral chaos of the car chases (which Miller clearly realized when it came time to make a sequel). But the climactic violence is tough, brutal, and (most importantly) affecting--the pain makes us flinch, and gives us a rooting interest in Max's actions in the punchy, powerful closing chases and ingenious final scene. As iconic as it has become, Mad Max is best enjoyed as it was originally seen--as a rough and tumble, adrenaline-fueled exploitation picture. It is deeply flawed, as many of those films were. But its energy and power are still very much intact, even after decades of sequels, rip-offs, and unfortunate PR moves by its leading man. Stripping all of its subsequent pop culture trappings away, Mad Max remains a tough, dark, muscular little action movie. NOTE: For background into the Australian exploitation industry that spawned the film, I cannot recommend the recent documentary Not Quite Hollywood highly enough. "Mad Max" is available now on DVD and Blu-ray. For full A/V and bonus feature details, read this review on DVD Talk.